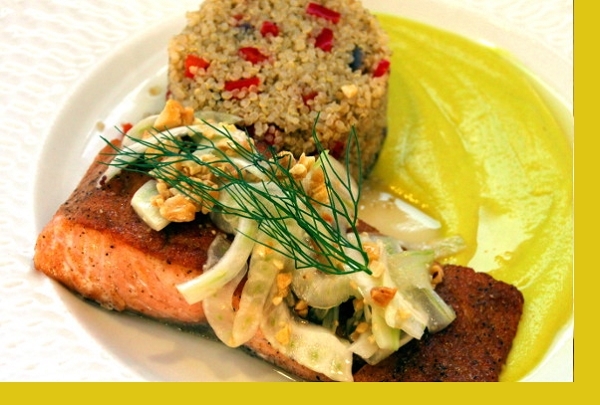 Pan seared salmon topped with a peanut fennel slaw accompanied by a delicious coconut sauce. Served with quinoa - a superfood loaded with protein, fiber and minerals. Preheat oven to 400°F then coat a skillet with oil and heat on high heat. When hot, sear salmon 2 minutes per side. Place in supplied pan and bake the salmon 15 minutes or until cooked through to desired doneness. Reheat sauce and quinoa in microwave. 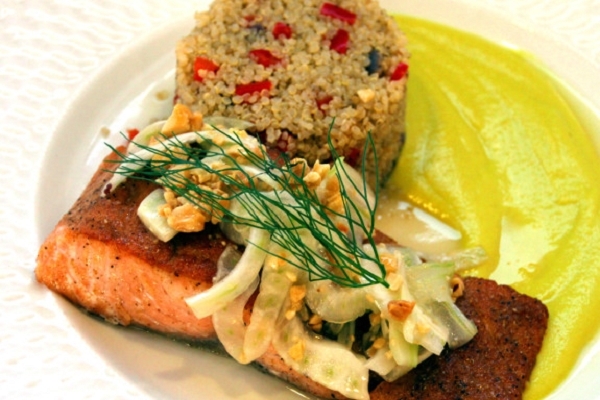 Mix fennel slaw with the dressing, spread atop the salmon then serve. Perfect dinner. Healthy and delicious. I love salmon, but the coconut sauce that comes with it, makes it really special. I don't care for quinoa. I would prefer the white rice instead.